Details: Metal soffit and dentil work over pinched windows flanked by brick pilasters, over metal cornice with garlands and dentils, over Palladian stained glass window with terra cotta cornice on side sashed and curved brick arch center with terra cotta filigree, Over arcaded entrance with stone piers and pilasters and brick arches and terra cotta school nameplate, terra cotta details below entrance roof, main facades have variegated narrow brick and coursed stone base with heavy, detailed watercourse, main floor arched windows with brick arches supported on pilasters in between and terra cotta sills, large plaster soffit overhang on roof with metal brick dentil course below it, corner pilasters with terra cotta details. Plan: L Shape, with additions. Significance: A4: The restrained classicism, the crispness of the detail, the monumental siting and handling of clear-cut masses, and the generally excellent proportions combine to make this an excellent design. A5: Patton and Fisher, later Patton Fisher and Miller, later Patton and Miller, was a prolific Chicago firm. Norman S. Patton specialized in schools, libraries and college buildings. A fellow of the American Institute of Architects, he graduated from MIT in 1874 and developed a large practice over the years. 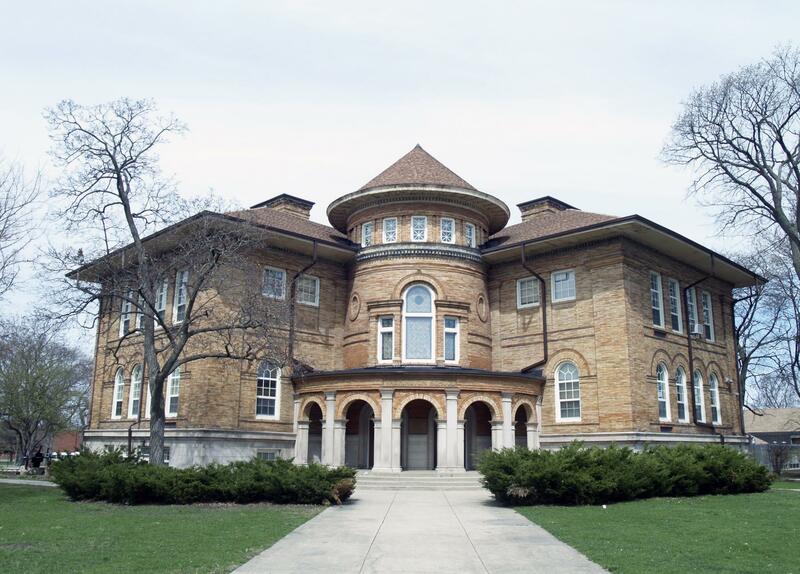 This is the only Evanston school which Patton designed. A9: This structure appears on the Illinois Historic Structures Survey. Alterations: Multiple additions to the north of the original building, replacement windows on east and south elevations.